Here we compare wiring an electrical receptacle in series or "daisy chained" (the most-common practice) with wiring receptacles in parallel on an electrical circuit. Wiring in parallel gives greater reliability to the devices on the electrical circuit, but larger electrical boxes and more wiring connections are required. In this article series we illustrate basic connections seen in the field for the black, white neutral or grounded conductor), and ground wire when hooking up an electrical receptacle (wall plug or "outlet"). Watch out: mis-wired electrical receptacles are dangerous. Electrical wiring should be performed by a licensed, trained electrician and should comply with the National Electrical Code and local regulations. 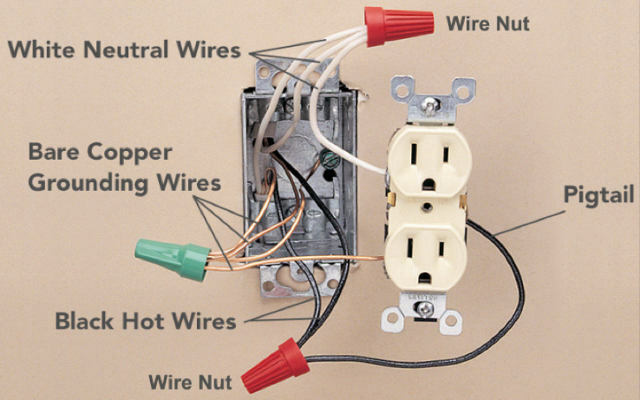 This article series describes how to choose, locate, and wire an electrical receptacle in a home. In our photograph of the back of an older electrical receptacle (synonyms used by normal people include "outlet" or "wall plug"), this back-wired receptacle illustrates wiring electrical receptacles in series or "daisy-chained". The pair of white wires in the upper portion of this photo are are marked as NEUTRAL IN and NEUTRAL OUT. White wires are to be connected to the silver terminals or screws or to the terminals marked "WHITE" or "NEUTRAL"
One of these white wires brings the neutral wire of the circuit in to the electrical box and connects to the receptacle. The second white wire connects the circuit neutral onwards to the next receptacle downstream from this one. The pair of black wires in the lower photo are marked HOT IN and HOT OUT. Black wires are connected to the brass or gold colored terminals or screw or to the terminals marked "Black" or "Hot". One of these black wires brings the circuit hot or "live" wire in to the electrical box where it connects to either of the receptacle's "hot" or "black" terminals. The second black wire connects to the receptacle's second "hot" or "black" terminal and carries the circuit's hot or live wire onwards to the next receptacle or device that is downstream from this one. Power to all downstream devices flows through the receptacle's internal parts. Back-wiring is an accepted wiring practice, though on newer receptacles and in my opinion better workmanship jobs you will see the wire connections made at screws or screw clamps more often than in simple push-in backwired connections. Watch out: we do not recommend back-wiring receptacles that use only a spring-clip type wire connector. Those connections are not in our opinion reliable nor safe. Photo: this reader-provided illustration shows how an electrical receptacle might be wired in parallel to the circuit. Using twist-on connectors and pigtail wires the receptacle's neutral and hot terminals are connected to the circuits hot and neutral wires. In some jurisdictions electricians prefer to not "daisy chain" receptacles in the same box together by using the second pair of screws on each one. Rather the circuit enters the box and using twist-on connectors, short pig-tail wires are connected to each receptacle at the proper screws. This approach requires a larger electrical box as it will contain more connections, connectors, and so needs more room. The black or "hot" wire from the circuit entering the electrical box goes to a twist-on connector or "wire nut"
The black or "hot" wire leaving the electrical box to go onwards to the next electrical box (and devices) downstream goes to the same twist-on connector. The white or "neutral" wire from the circuit entering the electrical box goes to a twist-on connector or "wire nut"
The white or "neutral" wire leaving the electrical box to go onwards to the next electrical box (and devices) downstream goes to the same twist-on connector. 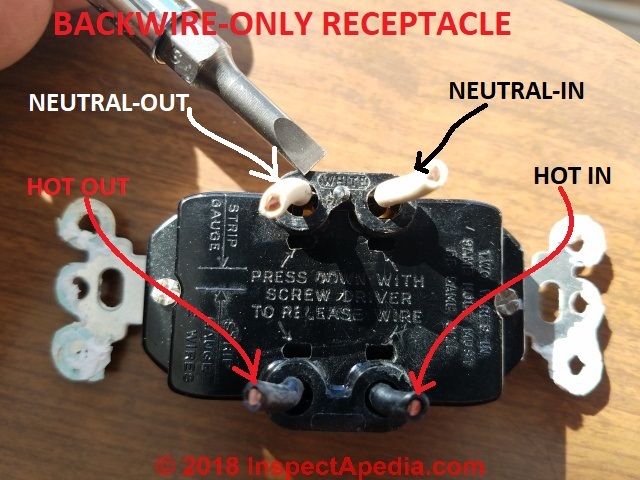 At BACKWIRED RECEPTACLE FAILURE REPORT we illustrate a use of these two wiring practices in which the contributor is replacing a back-wired daisy-chained receptacle with a new receptacle wired in parallel on the circuit. Watch out: when converting from device-wired to a parallel-wired electrical circuit in a string of receptacles, you can not use this pigtailing method unless the electrical box size is of sufficient cubic inches to contain the additional wires and connectors. all of which have to jam into the electrical box. Using NEC box sizing rules that's a total of 7 #14 wires. Assuming the circuit we show is a 15A circuit using #14 wire, the U.S. NEC requires 2 cubic inches per conductor. The box must be (2cu.in. x 7 conductor) 14 cubic inches or larger. The National Electrical Code Article 314 contains complete details and tables of electrical box sizes in dimensions and cubic inches and should be consulted for complete accuracy because the actual size of the box required, in cubic inches, depends on the number of wires that will be within that enclosure. If you need more space than the present box allows, it may be possible to expand the existing box by adding a "side car" extension described in the article cited just above and illustrated in our photo. That's a heck of a lot easier than pulling the whole existing box and wall apart to replace it with a deeper or wider box. Watch out: some devices such as AFCI and GFCI receptacles will have LINE and LOAD markings on the receptacle side or back. 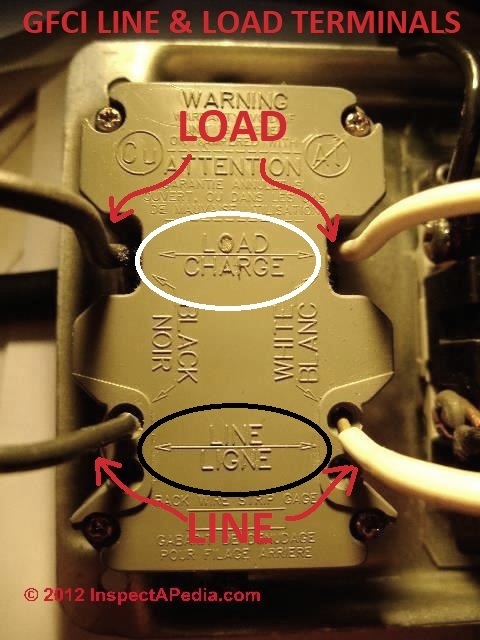 In my GFCI photo I have circled in white and black the embossed markings on the receptacle back that indicate "LOAD" and "LINE" terminals. The incoming or LINE white (neutral) and black (hot) wires are in the bottom of the photo. The outgoing or downstream or LOAD white (neutral) and black (hot) wires are in the top area of the photo. Details are at WHICH WIRES GO to LINE or LOAD CONNECTIONS? Watch out: If you do not make these connections properly power will still be delivered to the GFCI receptacle but it will not provide proper GFCI protection for downstream devices and/or its internal test and reset buttons will not function. 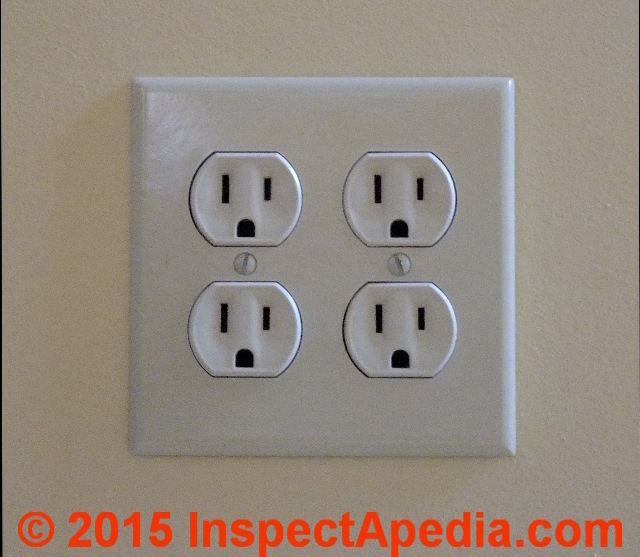 Continue reading at ELECTRICAL RECEPTACLE CONNECTION DETAILS or select a topic from closely-related articles below, or see our complete INDEX to RELATED ARTICLES below. 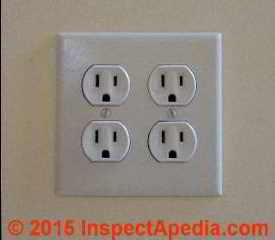 Or see ELECTRICAL OUTLET, HOW TO ADD & WIRE - home - for general wiring procedures, connections & advice for connecting electrical receptacles. WHICH SCREWS GET the BLACK, WHITE & GROUND WIRES ? WHICH WIRES GO to LINE or LOAD CONNECTIONS? NUMBER of WIRES NEEDED: 2-WIRE, 3-WIRE, 2 or 3 WITH GROUND? 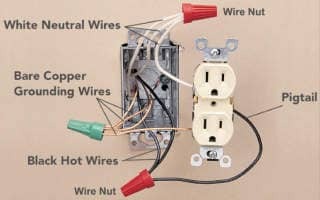 If you are wiring a 2-wire electrical circuit that has no ground wire, also see CONNECTION for 2-WIRE RECEPTACLE CIRCUITS for proper wiring details. 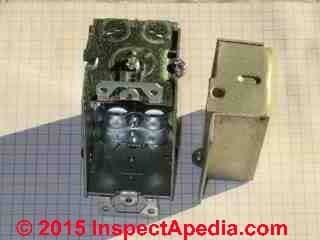 ELECTRICAL RECEPTACLE WIRING SERIES vs PARALLEL at InspectApedia.com - online encyclopedia of building & environmental inspection, testing, diagnosis, repair, & problem prevention advice. I am replacing an outlet that has the top half on a switch and the bottom half always on. The old outlet had stab wire connections for a black, white and RED wire in the top section. I have tried to install the new outlet, using the screws as recommended, rather than the stab connections, and cannot make the top half work on the switch. (I tried with the tabs in place, one tab removed and both tabs removed. Also tried the red & black on the same screw, red on the screw and black in the stab hole and the reverse.) How to I make the switch work? 1. to power the upper and lower halves of a receptacle separately we have to break the line-in or black wire or power tab. You can break apart the tab on the white wire neutral side but those connections are going to be made common by a splice in the electrical box anyway. 2. The line-in power wire into the receptacle box is split into two feed wires. One goes to the lower "always on" half of the receptacle line in screw while the other connects to a wire leading to the receptacle switch. The return wire from that switch then connects to the line-in or black wire or gold-colored screw on the receptacle. I am an apprentice in house wiring I wired a four plate stove like this: I installed 30A circuit breaker in the consumer unit and ran wires to the kitchen where I connected the wires coming from the breaker box to the line (input) an I connected the load to the stove I used 2.5mm. I tested the it and is working but now my question is did I do it right? is the 2.5mm ok for the circuit? Is there a negative impact the wire size will have in future? James you don't identify your country nor voltage levels. Typically an electric stove is wired on a 220V-240V circuit, sometimes depending on stove design, some burners may use always or part time just one 120V leg. I'm not quite clear on what you did. Did the 4-plate electric stove come with wiring instructions and a wiring diagram? I would be embarrassed to say I allowed the pictures in this article to be a part of this page. You really need to take a quick look at NFPA Article 110.3 and 110.4 and do it quick. Tom, thank you for your comment. Indeed I expect licensed electricians to know how to make proper electrical connections. And to be familiar with the national electrical code. We do, however, often include photographs of as-is wiring as important illustrations of what's found in the real world - in the field. Showing what people actually do, right and wrong, can be useful. While we regret that you might be embarrassed, explicit, technical comment would be more helpful than shame tossed over the electronic-wall. Your comment to look at NFPA Article 110.3 probably intended to refer to the National Electrical Code NEC 110.3 which gives advice for the examination, installation, and use of [electrical] equipment and includes the expectation that such wiring details are inspected by the local electrical code compliance officer. NEC 110.4 includes "The voltage rating of electrical equipment shall not be less than the nominal voltage of a circuit to which it is connected. " Referring readers to a mere paragraph number that points to lengthy electrical code specification without any specifics is not helpful.